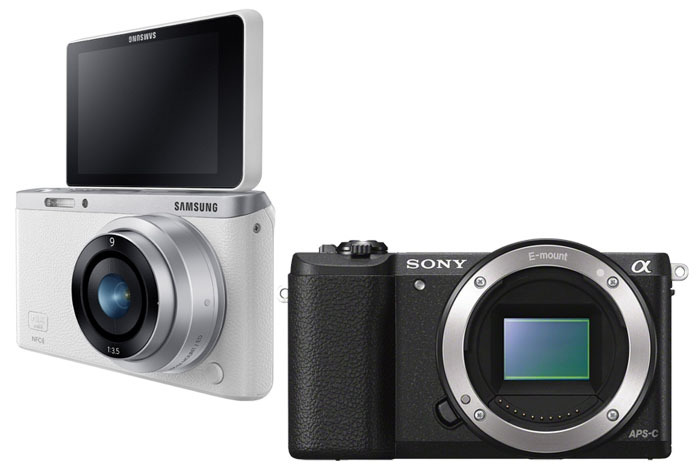 So, you are now not sure to choose between Samsung NX Mini and Sony a5100, aren’t you? Samsung and Sony are both known worldwide as great companies that produce various kinds of high-quality products, including mirrorless digital cameras. When it comes to an entry-level mirrorless digital camera, Samsung NX Mini and Sony a5100 are both feasible choices. Samsung NX Mini has always been popular as a great value for the money, as the model comes readily with the lens. On the other hand, Sony a5100 is a little bit more expensive, but has top-notch performance and output quality. Which one should you choose? If compactness and portability are important to you, Samsung NX Mini indeed has a better edge here. Between the two models, Samsung NX Mini is slimmer and lighter than Sony a5100, allowing you to easily slip it into your pocket or your bag. However, due to the slimness, it has less gripping area. Sony a5100, on the other hand, comes with an ideal design that allows a decent solid grip. Now, if you mainly use your camera for photography, then Sony a5100 is almost always the best way to go. It comes with a better sensor and engine. While Samsung NX Mini relies on a 20.5-MP BSI CMOS sensor, Sony a5100 offers a sensor resolution of 24 MP. Not only that, but its sensor is also APS-C, which is larger than Samsung NX Mini’s sensor. So, Sony a5100 is able to generate larger images with more sharpness and details. The images also have better, more accurate colors and better dynamic range. Sony a5100 is also faster than Samsung NX Mini. Well, Samsung NX Mini indeed has an astonishing maximum shutter speed of 1/16,000s, which, combined with the ISO range, allows you to has extensive control over the images. Sony a5100’s maximum shutter speed is a decent 1/4,000s, but it has less shutter lag. It also has a much larger buffer capacity, up to 67 JPEG shots or 25 RAW shots. Both models have a continuous shooting speed of 6 fps. About the focus system, Sony a5100 is certainly the superior product. In fact, it is loved by many users due to the powerful autofocus system. Featuring a 179-point phase-detection autofocus, it can track even fast-moving objects with no problem. The focus peaking ensures that you can always tell what is in the focus. Samsung NX Mini is pale in comparison, having only 21 focus points and no phase detection. Samsung NX Mini is the way to go only if you really have to save some bucks, and if you require the mic jack. Otherwise, Sony a5100 is the better option due to the far more superior image quality and performance.